SURIGAO CITY (MindaNews / 16 Feb) — Survivors of the February 10 magnitude 6.7 earthquake and city officials here are asking President Rodrigo Duterte to clarify his order to have P2 billion pesos released, as they understood, for those who lost lives. 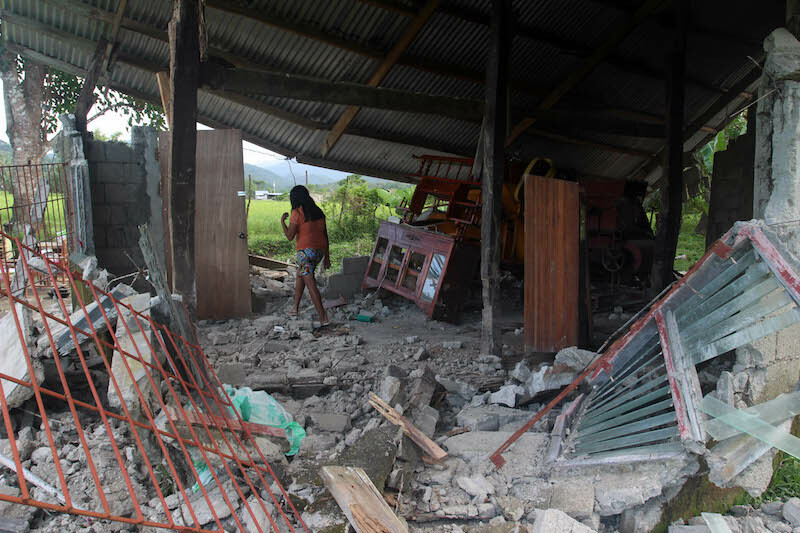 livelihood and property due to the quake. Duterte on Sunday told Surigaonons at the gymnasium here: “Naa koy buhiang kwarta gamay so susteha gyud na sa katong mga nawad-an ug kinabuhi. Murelease ko gamay. Mga two billion tama na siguro? Di man na ninyo mahurot no?,” (I will release a small amount so prioritize those who lost their lives and livelihood. I will release a small amount. Is two billion sufficient? You can’t finish all that) and in jest he added, “Hala paliti nalang ninyo ni sila’g subdivision ug house and lot tanan” (Go ahead, buy everyone a subdivision house and lot). Others, however, have interpreted Duterte’s mention of P2 billion as one of his hyperbolic statements. Surigaonons understood the PhP 2 billion as intended for the quake victims and the rehabilitation efforts. But their euphoria about the amount was short-lived because of the contradicting statements made by officials of the Presidential Communications Office. Communication Secretary Martin Andanar in a radio interview on February 13 said the P2 billion was for workers who will be displaced when the mining firms stop operations, as earlier ordered by Environment Secretary Gina Lopez. “I would like to clarify that,” Andanar said about the P2 billion fund. “The President was saying that in the context of the mining… problem, na kapag naisara ito mangangailangan ng trabaho yung tao,” said Andanar, who was seated a few meters away from where the President delivered his speech on Sunday. Andanar was reported to have told a CNN reporter that the P2 billion was “a speculative allocation” which will be used if and when people lose their jobs if mining operations in Surigao are stopped. The next day, February 14, Presidential spokesperson Ernesto Abella told the Malacanang Press Corps the money was intended for the quake victims but was not categorical that the amount Duterte promised was P2 billion. Abella did not include the P2 billion in his translation. Both Abella and Andanar speak Cebuano, the language Duterte used when he mentioned P2 billion. “The essence of the statement is not the two billion but that the essence of the statement is that he would release the monies and the funds to supply the needs of those affected by the earthquake victims,” Abella explained to the Malacanang reporters. “I understand where you’re coming from, that the figure is important. However, the collective intent of the President is to provide for all their needs,” Abella replied. Asked by MindaNews on February 15 how much Duterte allocated for Surigao, Abella replied, “sinabi niya mag re-release siya ng kaunti, para makatulong sa nawalan at namatay. Walang definite amount. Basta ma cover lang yung nawalan at namatayan” (he said he would release some amount, to help those who lost their properties or lives. No definite amount. But enough to cover for what is needed to address these concerns). Engr. Marlyn Pono, officer in charge of the Provincial Disaster Risk Reduction and Management Office (PDRRMO) said they have estimated the damages at PhP 687.48 million broken down as follows: national roads & bridges at PhP 201.8 million; damage to infrastructure at P194.8 million; damage to school facilities at P176.5 million; damage to provncial government building at P104.3 million; electric power at P7.3 million; water supply at P2.3 million; and the Caraga regional hospital at P488,000. The amount does not include the cost of relief and assistance to quake victims. Secretary Judy Taguiwalo of the Department of Social Welfare and Development told reporters last Sunday that 1.5 billion pesos will be used for quake victims. Roger de Dios, regional director of the Mines and Geo-sciences Bureau believes the P2 billion fund will be for quake victims and rehabilitation of various government infrastructure. “I don’t think that fund will be used for the massive displacement of mine workers,” he said in a telephone interview. “Nagtuo kami nga para sa biktima sa linog, mga nawad-an og trabaho gumikan sa linog ug para sa mga nadaot nga imprastraktura,” according to Rey Suravasquez, a teacher who personally heard Duterte’s message. Before the quake struck Surigao City, Envirnoment Secretary Gina Lopez had announced that 14 mining companies in Dinagat and Surigao Provinces will be closed.